We now offer a full range of repair services for all your denim jeans, jackets, and shirts. We're capable of almost anything you can imagine including putting on new buttons which have come off, repairing any holes, fixing torn pocket bags, reinforcing leather tags, re-chainstitching broken hem lines, and even installing real iron riveted suspender buttons. We're happy to announce that you can now have your jeans hemmed with a vintage Union Special Chainstitching Machine at all four of our stores. Also, with a chainstitch your hem will form a beautiful roping effect after time due to the opposite pull of denim from the hemming process and during washing/shrinking. Wabi-Sabi Indeed. All jeans bought in-store at SESF, SENY, SELA, or SEPDX will be hemmed with our chainstitching machine at no extra cost to you, all previously owned jeans can be brought into the store to be chainstitched for a fee of $25. Chainstitching for online orders is available for a fee of $15. Chainstitching takes between 2 and 5 days at all stores. We have acquired a 1950's Singer Darning machine at each of our stores and are now capable of repairing all holes in your jeans without the use of patches. 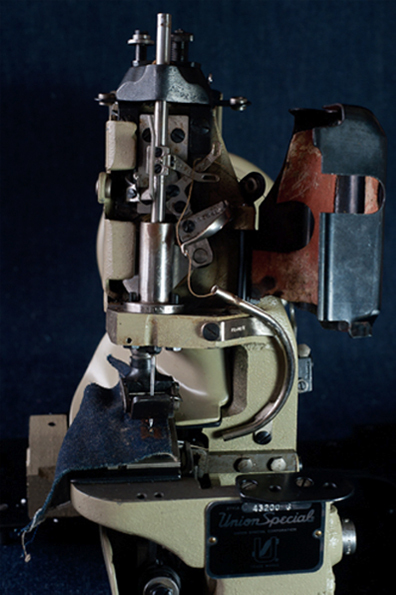 This is how jeans were repaired from the turn of the century up until the 1960's. The machine has two threads, both indigo colored (or black/gray for black denim), and essentially creates denim where there is no denim and weaves it into the edges of the torn fabric, it's like magic and far more comfortable and cleaner looking than patching; this was the way all industrial tailors repaired jeans years ago. All garments must be brought into one of our stores, we are currently not accepting mail-ins. The cost for repairs is a flat $30 if the jean was bought from Self Edge or $40 if the jean was not bought from Self Edge regardless of what needs to be done to the jean or jacket. 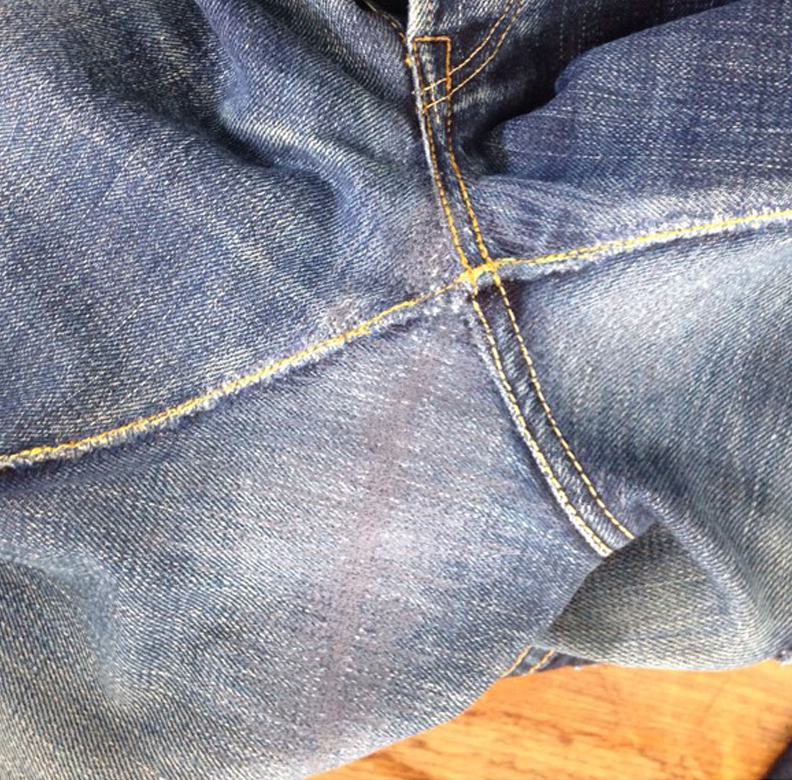 There is a $20 surcharge if there are more than three areas to be repaired on any single jean or denim jacket. 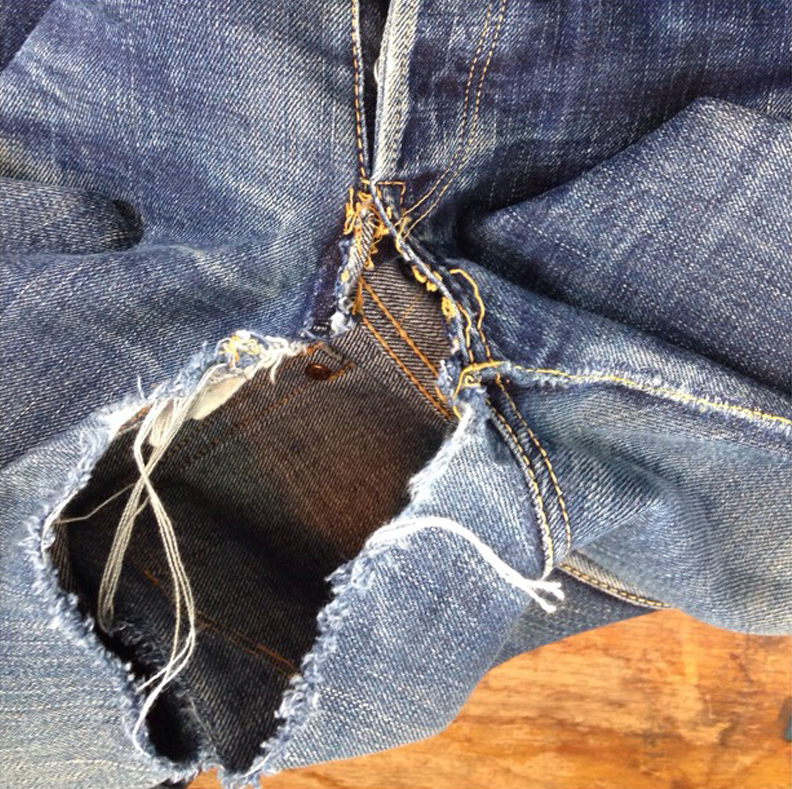 There is a $40 surcharge if there are more than six areas to be repaired on any single jean or denim jacket. We will only work on clean garments. If you haven't washed your jeans or jacket in a while, a good time to do it would be before dropping them off for repairs. We require all garments to feel/smell clean and freshly washed before being accepted for repair or alteration work. All work takes between 15 to 21 days. We will only work on clean garments. If you haven't washed your jeans or jacket in a while, a good time to do it would be before dropping them off for repairs. All work takes between 15 to 30 days.